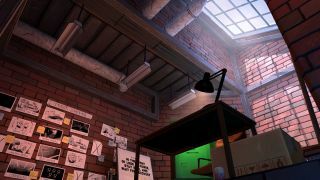 Two days ago, the co-creator of The Stanley Parable, William Pugh, teased a new game that's in the works at his Crows Crows Crows studio. Today it stands revealed, and the name of the thing is so long that I literally could not put it in the headline in any way that would make sense. Thus I present to you here his next creation, now on Steam, called Dr. Langeskov, The Tiger, and The Terribly Cursed Emerald: A Whirlwind Heist. A Whirlwind Heist—because no way am I using that full handle each and every time—is "a 15 minute heist game" in which you'll become a master thief, burglarizing his way across the hottest summer in Europe. It features voice acting by British comedian Simon Amstell, formerly the host of Never Mind the Buzzcocks, who seems to be having a bit of a stressful time explaining exactly what it is you'll be doing on this job. And that's really all I can tell you about it, because the guy who's supposed to write the Steam store description went on strike midway through as a result of what he claims are intolerable working conditions. Personally, I think he's overreacting a bit, but on the other hand who wants to get eaten by a tiger, right? Fortunately we have the trailer playing above to clear things up, and even more fortunately, it's free, so you can just leap in and see what's up without having to fork over any of your hard-earned wealth. If that's not good enough, you can also go have a poke around at Crowscrowscrows.com.